Today I was chatting with Danny, our IT guru at school, regarding the iPad and the discussion turned to the recent iOS6 upgrade. Danny reminded me about the fact that one can now upload files to sites on the Internet from within the Safari browser. 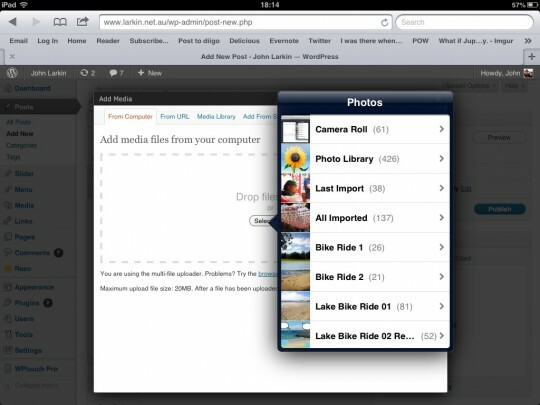 Specifically, images hosted in the Photos app. This is incredibly useful and as far as I am concerned this positive, evolutionary step makes a number of the apps on my iPad almost redundant: WordPress, Blogsy, Photogene & OneEdit. I had obtained all those apps as I sought ways to ease the burden of adding images to a WordPress post created on an iPad. I had even installed a WordPress plugin, Add From Server. The process is described in this post. One now simply taps on the upload media icon situated above the editing window in Wodpress and taps on the Select Files button. No drag and drop as yet. A floating window gives you access to the images in the camera roll and albums within the Photos app. In short, I am using a single app for publishing and I have access to the feature set of my WordPress theme which the blogging apps, WordPress and Blogsy, do not provide. This is a positive move by Apple. Works in the Chrome browser too. No more jumping through hoops.